Bonsai Trees was honored to be nominated for the 2018 New England Music Award for Best Band in CT! Local singer/songwriter James MacPherson was one of three talented young performers who won the 2016 New England RADAR (Rising Artist Detection and Recognition) Award on February 27, 2016, at a competition at the Hard Rock Cafe in Boston. The competition, sponsored by Pavoh.org, attracted 2,000 young regional artists, but only nine finalists were chosen to perform in Boston for a panel of judges, as well as host Charlie Farren from FARRENHEIT and The Joe Perry Project. The top three — James MacPherson, Rodolfo Arteaga, and the band Playing With Fire — were chosen as the “RADAR Class of 2016.” As a RADAR award winner, James will be participating in a year-long honor including performances, coaching and marketing opportunities, and a chance to give back to his community. Pavoh.org, founded by writer Laura Lamere, is a non-profit organization that strives to identify and promote musicians under 21 who are making music of uncommon quality and promise. Their mission is to provide young musicians with accessible learning opportunities that drive artistic growth and empower self-expression. James has been passionate about music since his childhood, writing soulful songs that belied his years and mastering an array of instruments. His parents, also musicians, encouraged his natural abilities: He was playing bass guitar by age 8, soon after began guitar lessons and as a preteen was already performing and recording his songs in his home recording studio. At 13, James made his professional debut on ukulele, performing an original song for hundreds of people at a local benefit concert honoring his first musical mentor, Steve Shore. At 16, he was interviewed by Erika Ariasand Logan Byrnes and performed live on CT’s Fox News in advance of his Wapping Fair performance. James has now recorded more than 30 original songs and has an impressive list of past performances throughout New York and New England, at festivals, clubs, theme parks, and many live music venues. He is also lead singer and guitarist for the Connecticut band Bonsai Trees, a high-energy rock trio currently performing around the Northeast to promote their latest EP, “Live Free and Die,” a follow-up to their critically-acclaimed debut CD “Minimalist.” James is the primary songwriter for the band, which also includes drummer and back-up singer Nick Sokol and bassist Sean Millane. 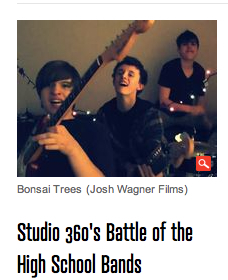 Their music has a wide appeal and resembles bands such as The Black Keys, Green Day, Nirvana, and The Strokes. Bonsai Trees is currently recording their next CD. James will be performing both as a soloist and with Bonsai Trees on the RADAR Awards tour. Click here for a photo of Bonsai Trees performing at the St. Patrick’s Day parade on March 12, 2016 published in the Hartford Courant. At 16, James MacPherson is already an accomplished and revered songwriter, a multitalented musician, and lead singer for several notable young bands. He plays acoustic, electric and bass guitar, ukulele, keyboards, and drums, and composes compelling original songs that belie his youth. About to begin his junior year at South Windsor High School, he has developed a loyal, awe- struck following in the four years he has been writing, recording and performing his original material throughout Connecticut – and it’s just the beginning. James had just turned 13 when he performed an original song on ukulele at the highly publicized Steve Shore Recovery Trust Benefit Event in Bristol. More recently, James opened for the popular classic rock band Last Licks at Trinity on Main in New Britain, and co-wrote Last Licks’ original song “Phoenix Rising,” which they debuted at the show. James also opened for Freedom’s Reign at Loco Perro in East Hampton, and performed at the Zen Bar in Plainville as part of a homeless benefit show. Last Licks’ lead singer, Bill Wilson, introduced James as “one of his favorite people on the planet and the future of music.” James is scheduled to perform at the Berlin Fair this fall, as well. James will be appearing as a solo artist as well as with two of his bands at the 2012 Wapping Fair in South Windsor. On Thursday, Sept. 6, he will perform solo from 7 to 8 p.m. His indie punk rock trio, Bonsai Trees, will perform their original songs from 8 to 9 p.m. Comprised of James, Nick Sokol of South Windsor, and James Cryan of Glastonbury, the band is currently working on a CD, and recently performed at the Ray Beller All-Star Scholarship Jam in Manchester and at The Space in Hamden. 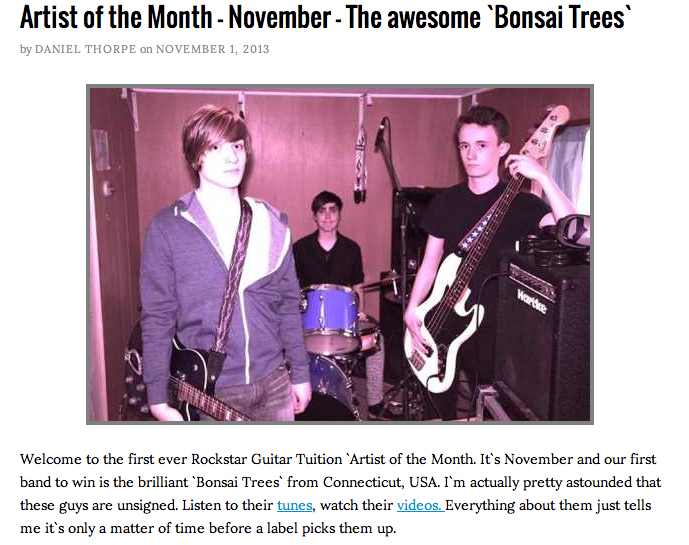 Check out their videos at http://www.youtube.com/bonsaitreesband. On Saturday, Sept. 8, James and his alternative rock band Iron-y will appear from 2:30 to 4:30 p.m. Comprised of South Windsor High School juniors Andrew Carey, Travis Gorman, Jack Tedone and James, Iron-y has appeared at many local events and venues, including Nomad’s in South Windsor, rocking crowds of all ages with original songs and fresh covers. Watch videos and read more at http://www.iron-y.com. The 2012 Wapping Fair will take place at Evergreen Walk in South Windsor, Sept. 6 to 9. For more information, visithttp://www.wappingfair.org. For more details about James, including music and videos, visithttp://www.jamesmacmusic.com.